I am always very impressed by bases who are "petite", but still, they are able & willing to do PS. One good example is Xiao Gao, a Taiwanese cheerleader. He was only 58 kg when he did liberty, cupie, full around and etc with me. This happened like 2 years ago? It was probably in 2007/2008. If I didn't remember wrongly, he could do a rewind as well. Not only he was proficient in PS, his gymnastics was stunning too. What I am actually to put across is that size should not be a factor to deter you (guys la) from trying PS. Excuses like "PS is only for those muscle big big kind", "my flyer is too heavy, the most I can achieve is extension" and so on are not justifiable! If you want it, then work for it! In fact, there are a few (just a few) in Singapore who are such good examples as well. They might not be as beefy but that has not stopped them from trying PS. It's a joy to see them achieving tremendous advancements. 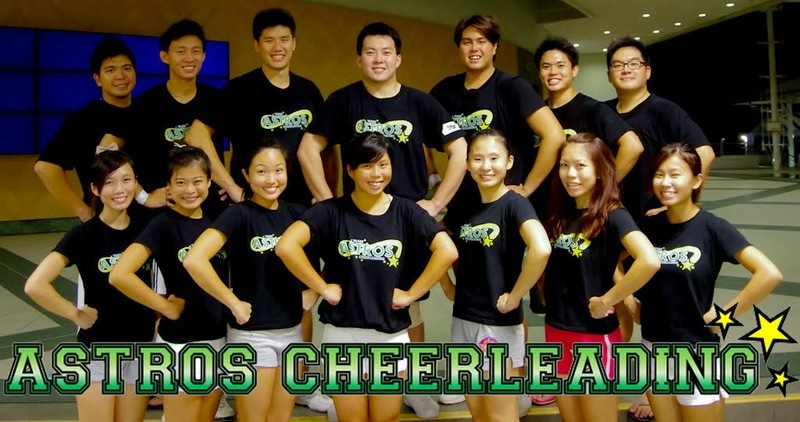 Yuen Bo started cheerleading back in 2003/04. Being a gymnast, his forte is definitely in gymnastics and because he is not very big sized, he was never really into partner stunt. He was contented doing his ROBT, ROBHSBHSBHS, ROLO, BHSBHSBHSBHSBHS etc. The most he did was a single base liberty. Only recently, after becoming a member of ASTROS, he has developed his love for PS. With the encouragement of his dearest teammates (and of course his own determination*), he has shown much improvements just within these few months. We, as teammates, are very proud of him. *Determination is not the only ingredient. Pls combine it with techniques, learnings..
Good job Yuen Bo and we hope to see more of your PS videos. On a note, his flyer is not those feather-light kind like 30 plus 40kg; she's 45.6kg. Anyway, he doesn't have the luxury to choose I guess. Lastly, please do not ignore your gymnastics progression.